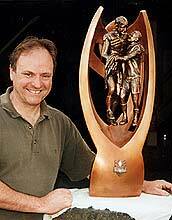 When I created the original 1998 National Rugby League Trophy it was a bronze casting that weighed 34 kilos compared to the 'Winfield Cup' which weighed over 40 kilos. Shown here is the second generation of the Trophy, created in 1999. It was cast in aluminium and now weighs 19 kilos. I also modified the design of the shell to reduce weight, afford better grip for the players and increase visibility of the Provan and Summons figures. The aluminium casting of the Provan and Summons figures was copper electroplated and treated to create the bronze look. The aluminium casting of the shell that surrounds the players was sprayed with molten phosphor bronze, hand ground and polished and then coloured with heat and chemicals to create its durable skin. 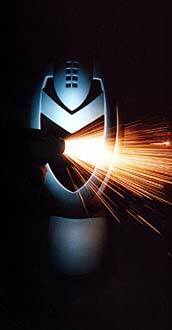 The design of the Trophy also includes the Rugby League symbols of the guernsey chevron, the ball and the shield.